The Daily Rant: Soup's On! I've made this recipe twice now and I have to say, this soup is comfort in a bowl. It's thick, creamy, flavorful, and easy to make. The hardest part of the entire recipe, is peeling the butternut squash! Seriously - it's an impossibly vegetable to get one hand around while peeling with the other. This time I did as Ed suggested and cut the squash into smaller pieces first, then peeled it. It was much easier to manage that way. 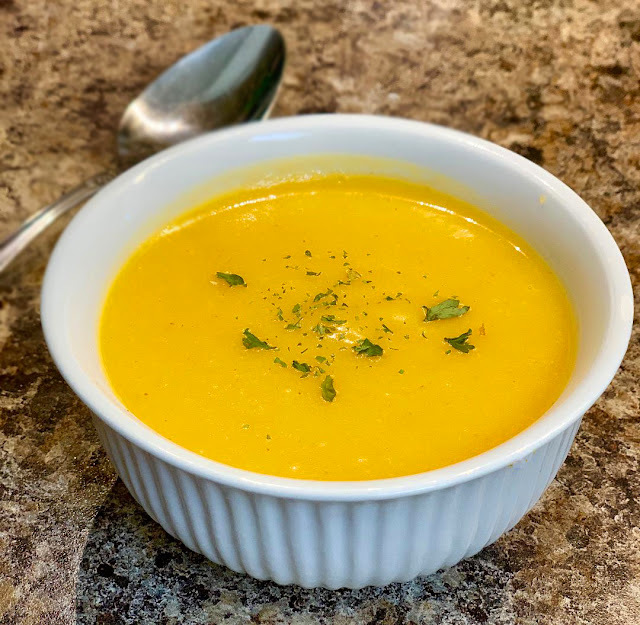 It's a quick recipe and it doesn't take long at all for the squash to get soft enough to blend. The first time I made it I tried my immersion blender but it was taking too long so I just scooped the ingredients out and put them in the blender and pureed it that way. This time I went straight from pot to blender the same way. Scooped the ingredients into the blender, got them nice and smooth, then dumped them into a large bowl. When it was all blended, I put it all back into the original pot to get everything nice and hot again. It was a big hit with all who tried it. And it's a perfect cozy soup for this time of year. 1. Add vegetable stock, garlic*, carrot, apple, butternut squash, sage, onion*, salt, pepper, cayenne, cinnamon, and nutmeg a large stockpot. Toss to combine. 2. Cook on medium-high until the mixture reaches a simmer. Then cover, reduce heat to medium-low, and simmer for 20-30 minutes until the vegetables are all tender and mash easily with a fork. 3. Remove and discard the sage. Stir in the coconut milk. 5. Taste, and season with additional salt, pepper, and cayenne as needed. 6. Serve warm, topped with your desired garnishes - a drizzle of coconut milk, some croutons, a sprinkling of black pepper or paprika, chopped herbs.